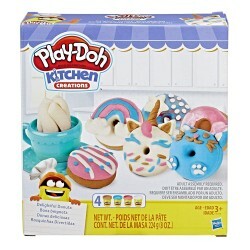 Go nuts for Play-Doh donuts! Ever imagine a unicorn donut, a critter-shaped fritter, or a multicolor cruller? Or maybe a classic vanilla glazed donut is more your style? Any way you like it, now you can get creative at your own make-believe donut café! Aspiring bakers can create and decorate a wild variety of colorful Play-Doh donuts in all shapes and sizes. 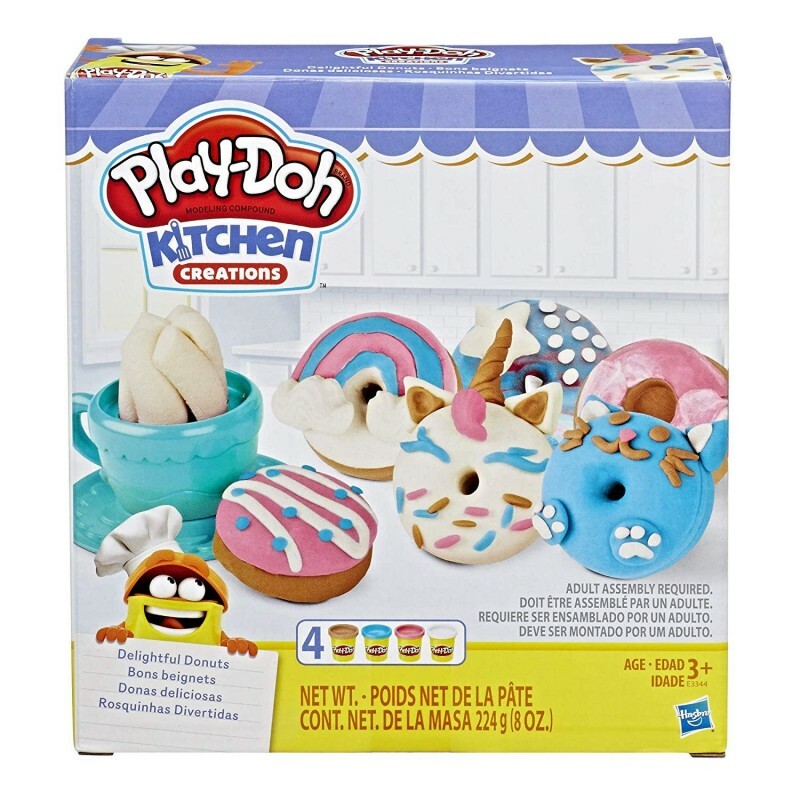 Shape silly donuts in classic shapes with the 4 molds and Play-Doh compound, and use the donut hole tool to stamp lots of pretend mini donuts! Top them with Play-Doh frosting and silly sprinkles with the frosting tool and sprinkle crank. Kids can even press swirls of Play-Doh steam and wacky whipped cream from the tea cup! Show off the creations on the stand, which also has half-molds to make Play-Doh cookies and toppings. For even more creative donut café fun, check out the creation cards with step-by-step ideas. Now all of your donut dreams can come true - minus the eating part, because these are a treat for the eyes only! • Includes unassembled stand, sprinkle crank, 4 donut molds, donut hole tool, frosting tool, teacup, 4 two-ounce cans of Play-Doh Brand Modeling Compound, 2 creation cards, and instructions. • Non-Toxic. Conforms to: ASTM D-4236. • Compound not intended to be eaten. • Product and colors will vary. • To clean, allow to dry, then scrape or vacuum. • Molded results vary depending on the child’s age and level of skill.